Although the real estate market has remained sluggish over the past few years, luxury home remodeling continues to show strength. Custom bathrooms, in particular, rank at the top of the list as a popular home upgrade. In fact, more and more homeowners are opting for creating a spa-like master bath. They want a retreat that rivals the best hotel baths. So what are some the top trends for the coming year? Luxury home remodeling for the master bath will incorporate a wide variety of high-end amenities. 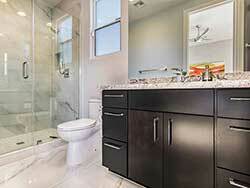 Snail showers and door-less showers will be high on homeowner lists for luxury home remodeling. So will multiple shower heads, body sprays and ceiling-mounted, rain shower heads. Some showers can have as many as 55 individual water jets, with each jet independently positioned. Steam settings can also be added to showers. Plus, free-standing tubs have received more attention lately. Similar to the old clawfoot tubs, today’s free-standing tubs can be stone, crystal or glass. They come in a variety of shapes, including rounded, rectangular and angled. They have become like a piece of sculpted art and a centerpiece of the opulent master bath. Master baths will incorporate more electronics, such as stereo equipment and TVs. This technology will be integrated in unique locations. For example, TVs can be integrated within mirrors or placed over the tub. Music can be configured as surround-sound for greater relaxation throughout the master bath, including the shower area. Digital controls are also being added to luxury home remodeling projects. In the master bath, homeowners can pre-program water flow, water temperature, music, lighting and more. Luxury home remodeling is returning to old world charm for the master bath. Vanities no longer look like stock cabinets. Instead, they’re like pieces of quality furniture transformed to function as a vanity. Gone are the days when sink choices were ceramic or acrylic. Today, luxury home remodeling options include sinks made of copper, bronze, stone, carved marble, glass, cloisonné, Venetian glass mosaic, hand-painted porcelain, pottery and more. While under-mounted sinks remain popular, the vessel sink has become a popular choice for remodels. In addition, fixtures are moving away from polished chrome to warmer hues, such as nickel, bronze, hand-polished brass and copper. Adjustable faucets have become the preferred fixture because they’re jointed in two or three places. This configuration lets you direct the water jet where you want it to go, as well as adjust the pressure of the water spray. Luxury home remodeling for master baths should include both overhead and wall lighting, especially at the vanities. Light from only one source creates shadows. When putting on makeup or performing any other personal grooming task, light coming from different directions will eliminate these shadows. Therefore, homeowners should add wall sconces or pendants to their overhead lighting. Other advanced lighting features for luxury home remodeling include LED lighting in walls and floor tiles. This type of lighting helps during the night. Some toilets are being equipped with built-in lighting as well. Advances in luxury home remodeling pop up all the time. It seems there’s always something new and exciting coming on the market. And this year’s trends offer no shortage of awe-inspiring ideas for a true master bath oasis.